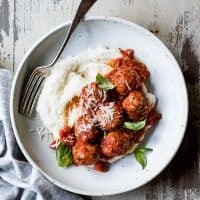 Dinner tonight is a comforting bowl of gouda turkey meatballs made with shredded zucchini and served with marinara over creamy cheesy baked polenta. Summer meets fall. With the Bay Area hitting peak temperatures now, I’m not ready to let go of summer just yet. Fortunately the markets agree and are still stocked with all of summer’s bounty. It seems as if no one is quite ready to transition while we’ve still got plenty of zucchini, nectarines, and plums. 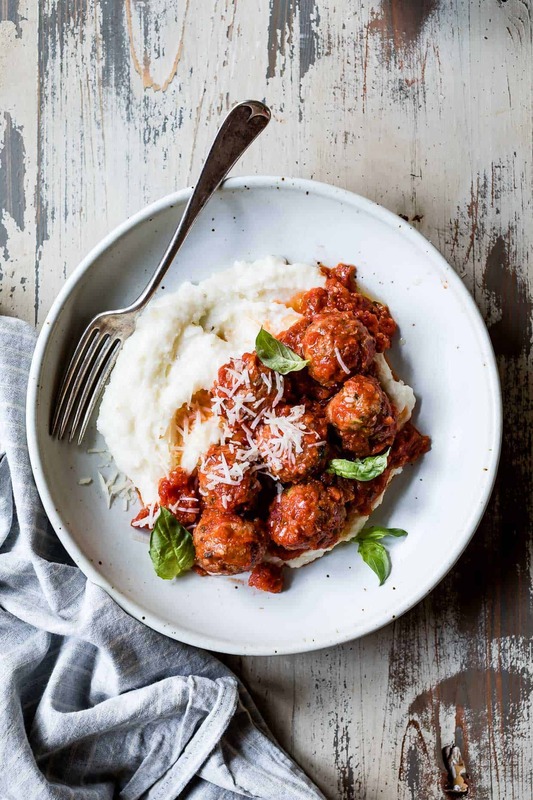 I’m sharing one last summer recipe before it’s all pumpkin all the time (not really) – shredded zucchini wrapped up in a warm comforting bowl of gouda turkey meatballs with cheesy baked polenta. 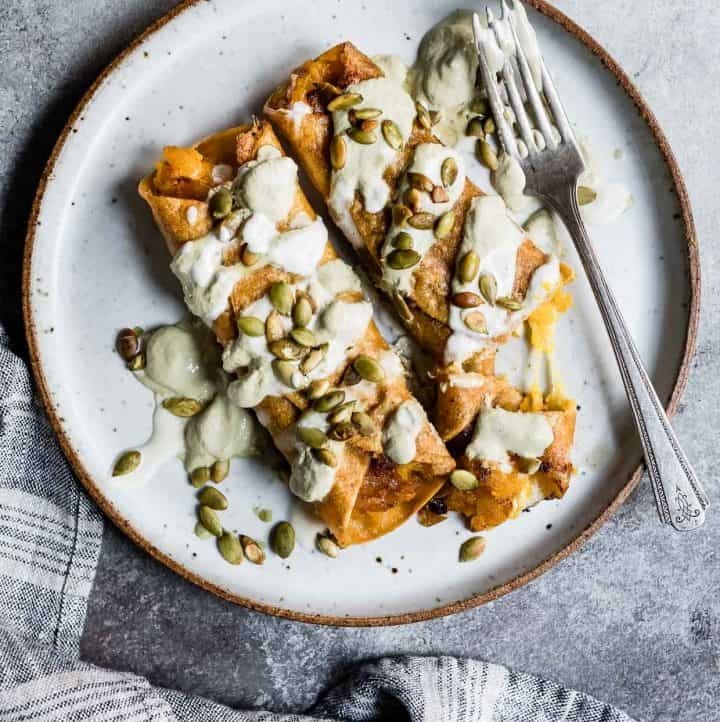 If you’ve already transitioned and left summer behind, some shredded winter squash would be equally delicious. This bowl of meatballs over polenta is the final dish in my summer menu video series partnership with Roth Cheese. First I made a sunflower seed gouda pesto condiment. Then we ate a breakfast of cheesy savory oatmeal bowls. For lunch there were avocado green goddess sandwiches sandwiches with havarti. These charred watermelon cheese wedges came out for summer backyard barbecues. 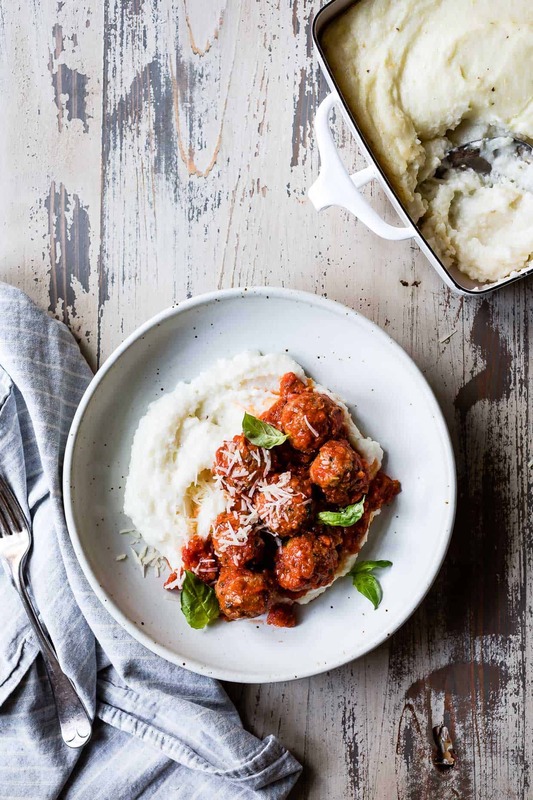 And now we feast on these cheesy zucchini turkey meatballs in marinara over baked polenta for dinner. Scroll to the bottom for the final video and recipe! Last night Zoella stood at her counter stool, eating dinner (her choice mealtime spot). I was busy around the kitchen while the cats meowed underfoot because their food bowl was empty. To keep Zo entertained while I tended to the cat food, I went on and on, “Oh no, the cats are hungry! They need food. Their food bowl is empty – we need to feed them…” And while I filled up their bowl, she quietly climbed down from her stool clutching her tiny bowl of polenta and meatballs. She placed it directly in front of Aoili (or as she calls the kitty, “Leelee”) and turned her fork to face the cat, waiting for her to eat. Yup, kid, we do need to feed the cats. Thanks for helping. (Cat lady in training). I also now know when she doesn’t respond to a question, she’s just ignoring me. This pint-sized sponge understands everything. 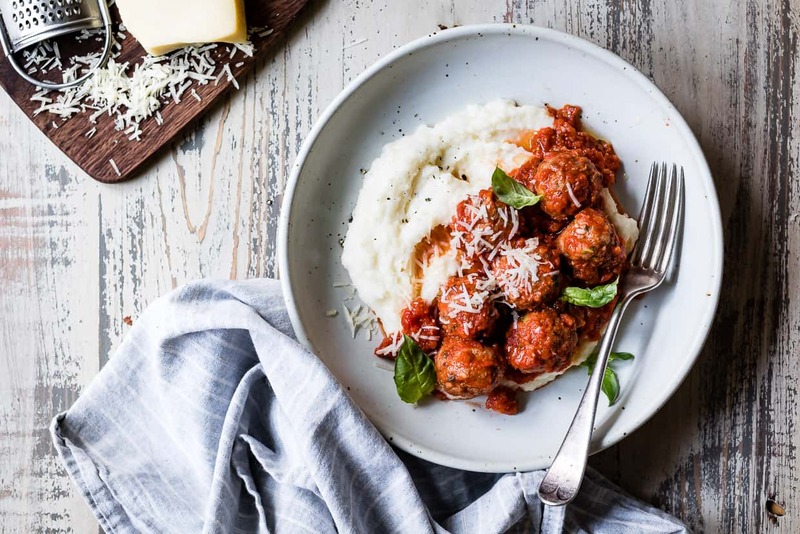 We’ve eaten these gouda turkey meatballs over creamy baked polenta for dinner about 5 times in the past month – it’s a new family staple. 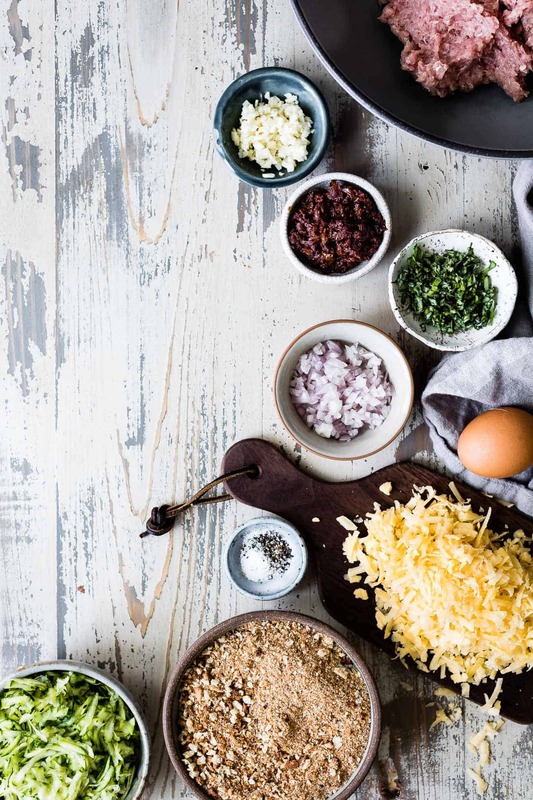 The key ingredient to making turkey meatballs taste equally as delicious as their beef/pork counterparts is to fill them with cheese. Turkey needs the ooey-gooey melted cheese to keep it moist and juicy – we use the same trick on our turkey burgers. In this case: Roth’s Vintage Van Gogh® Gouda (fancy aged gouda) adds that juicy bite and rich cheesy flavor. Normally we serve our meatballs over spaghetti, but we’re a bit pasta’d out as it’s one of Zo’s approved staples. To mix it up, I’ve served them over a bowl of creamy baked polenta – adapted from the sweet corn version from Alternative Baker. 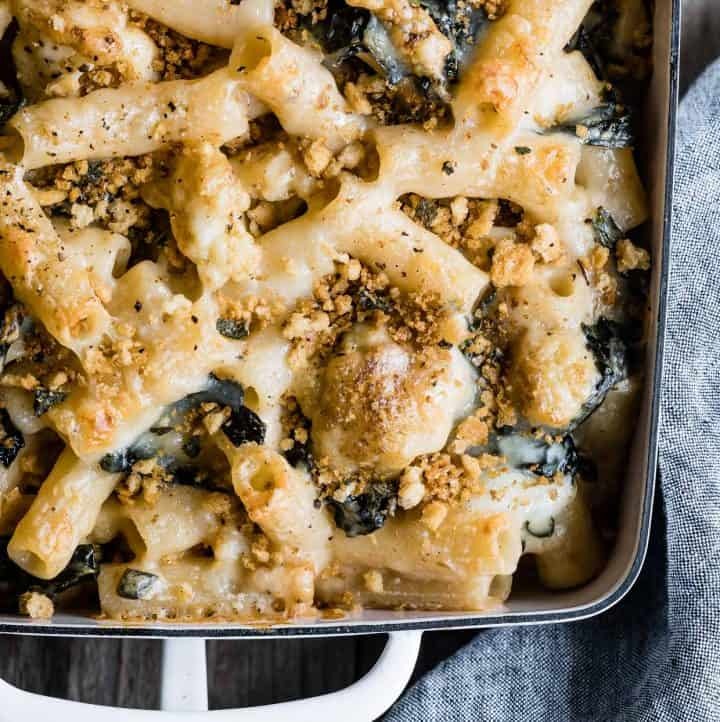 I’ve made it extra smooth and flavorful with Roth’s award-winning Grand Cru (gruyère is a suitable substitute, but the Grand Cru is worth searching for). 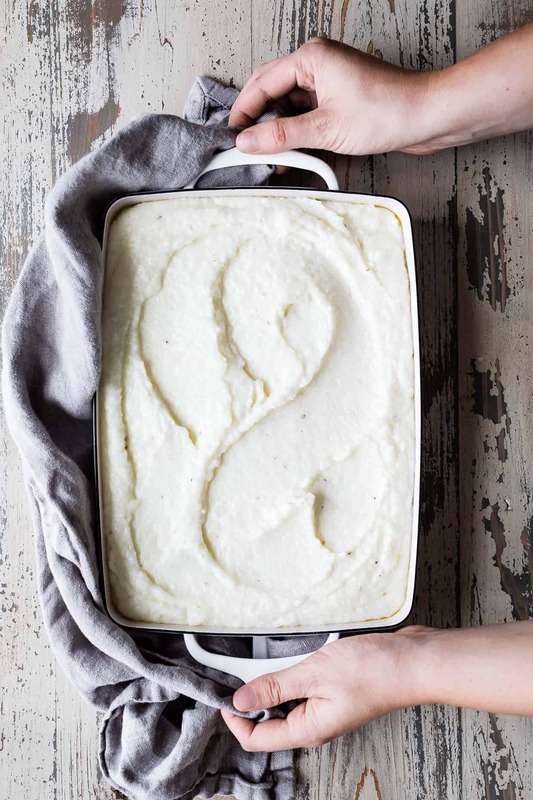 Folded in just before baking, it’s robust and bright without overpowering or weighing down the creamy polenta. Without further ado: the final video in the series! None of these would be possible without the help of my videographer partner, Alanna. See more of our videos on our Storied Provisions channel! 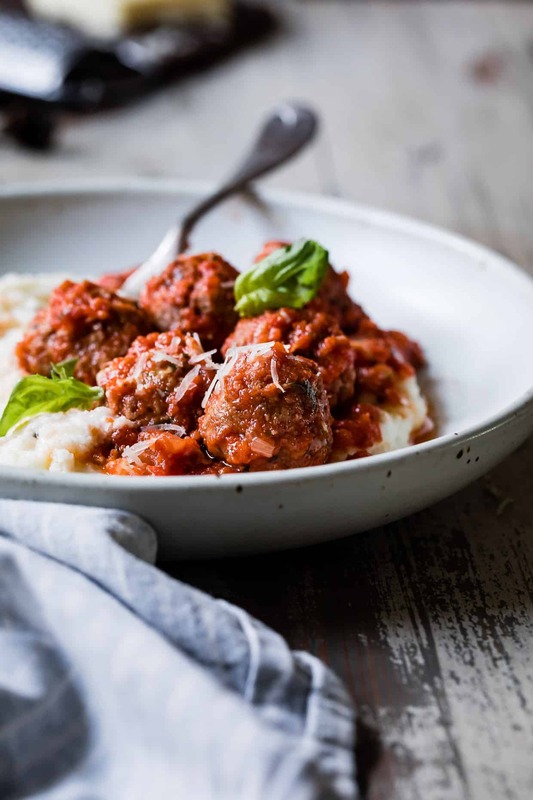 In a large bowl, combine all of the meatball ingredients (except for the sauce) and gently mix it until just completely combined, either with a wooden spoon or your hands. Be careful not to over mix or the meatballs will be tough. 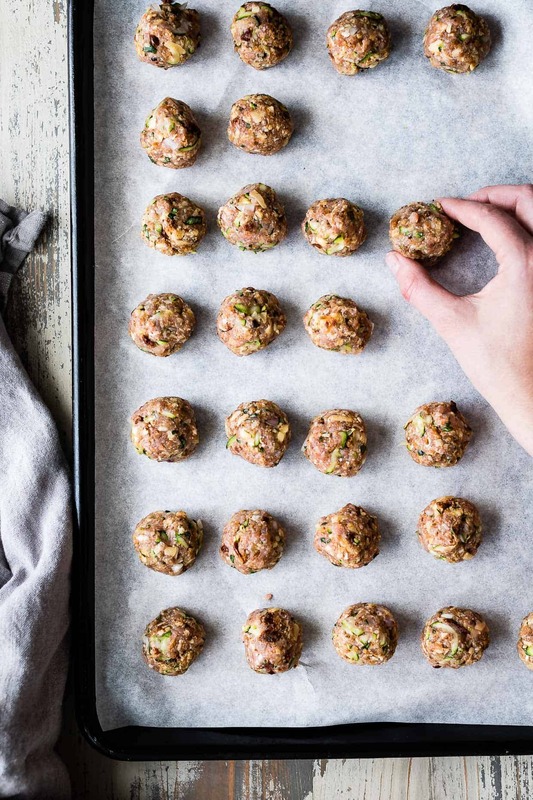 Using your hands, roll the meatballs into 1- 1½-inch balls and place 1-inch apart on a large parchment-lined baking sheet. Meanwhile, prepare the polenta as directed below. Bake on the middle rack for 15-18 minutes, until cooked through (I use a meat thermometer set to 165°F to check for doneness, but the cut-in-half method works too!). 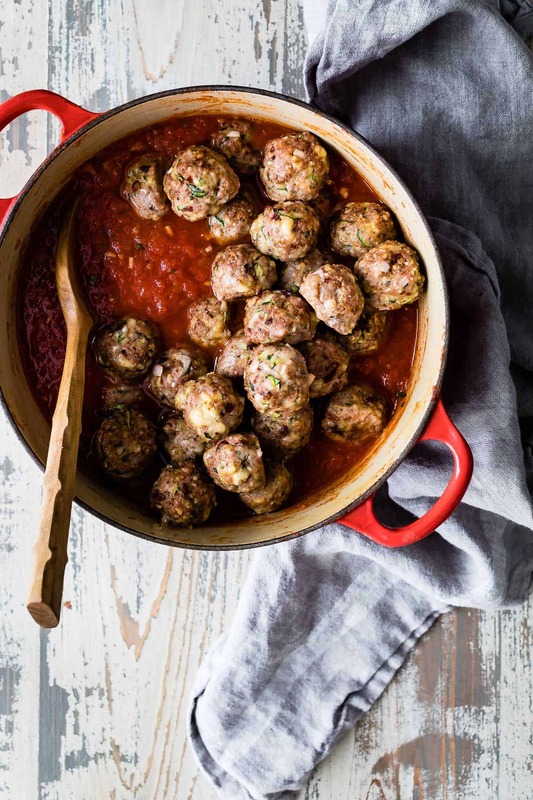 When meatballs are finished, warm the marinara (or use the recipe below) in a large pot. Add the meatballs and toss to coat. 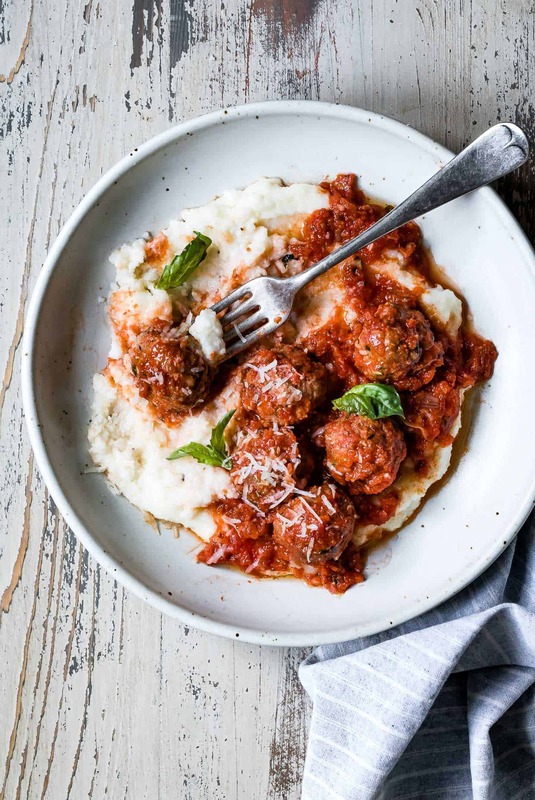 Serve meatballs and marinara over a spoonful of polenta. Rub a 9x12 baking dish with a pat of butter. In a large pot, heat the milk, water, and salt over medium heat, stirring occasionally, until just simmering, but not boiling. Reduce the heat to low and slowly pour in polenta, while whisking constantly. Continue whisking until the polenta thickens to a thin porridge consistency, about 5-8 minutes. Pour the polenta into the prepared baking pan, smoothing out the top. Insert it into the oven on the top rack while also baking the meatballs, 15-18 minutes.. When the meatballs are finished, reduce oven temperature to 325°F, lower the polenta to the middle rack, and bake for an additional 25 minutes. Serve immediately. The polenta will thicken as it cools. If making homemade marinara, heat the olive oil in a large pot over medium heat. Add the onion and cook, stirring, until it softens, about 3-4 minutes. Add the garlic and cook, stirring, for an additional minute. Add the tomatoes, basil, salt, and pepper and bring to a boil. Reduce heat to a simmer and cook for an additional 5 minutes. 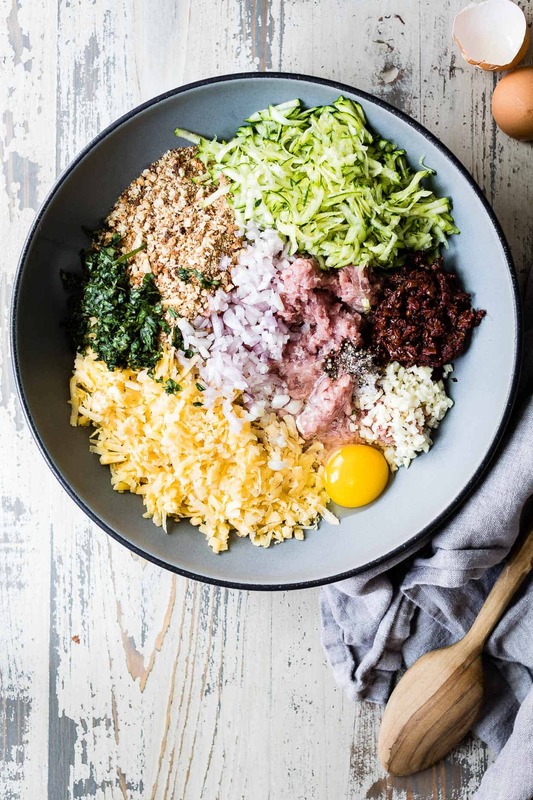 *I make my own gluten-free bread crumbs by drying out a chopped up loaf of gluten-free sandwich bread in the oven and pulsing it in the food processor until fine. I ate way too many of those beauties – sooooo good! I’m holding on tight to summer produce too – berries and nectarines and tomatoes every day. WOW!!! 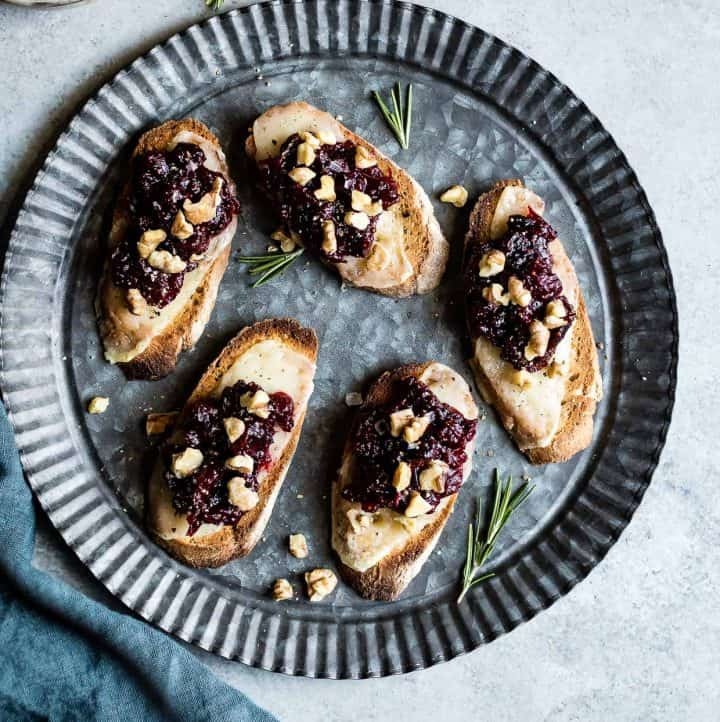 What an easy to make yet super creative recipe Sarah. My husband hates polenta so I never make it, but after watching this I don’t care!! I am making it for myself and will top it off with these meatballs. My husband can join Zoella and eat it with spaghetti, one of his approved staples as well. awww Zoella, cat lady in training. Just so sweet. We visited my dad a couple of weeks ago in Sebastopol, CA and it was 111 – he said it’s the hottest it had been in 35 years. Just brutal…and as Michelle said, ugh. Anywho, these meatballs and polenta! I want them right now for breakfast!!! My father-in-law is coming for a visit and these are on the menu! Thanks for the inspiration. 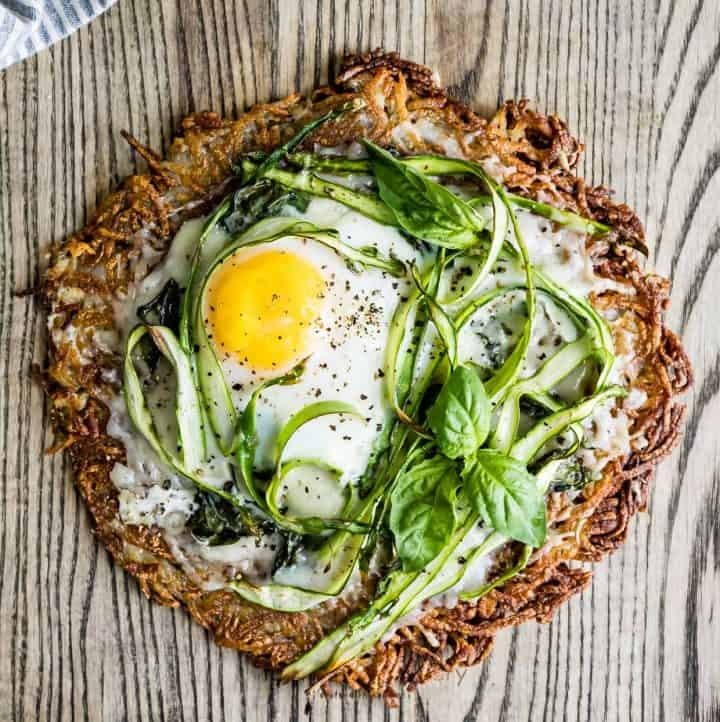 Wow just landed on this page in search of zucchini recipes and found this amazing recipe.